Binahong (latin: Basella rubra Linn, UK: Heartleaf maderavine madevine, China: Deng san chi) is a medicinal plant grown in lowland and highland and has many benefits for healing various diseases ranging from mild to severe. Binahong plant is a creeper with long form could reach five meters. Have soft stems, cylindrical, intertwined, red, and smooth surface. Of each plant can be utilized binahong mostly from tubers, stems and leaves can be used in herbal therapy. Binahong in terms of pharmacological effects Based on research, binahong excellent for revitalizing the skin, providing extra stamina, blood circulation, prevent stroke, and gout. Besides consuming binahong able to enhance male vitality, overcoming the swelling and blood clots, restoring weak condition and heal wounds after surgery. 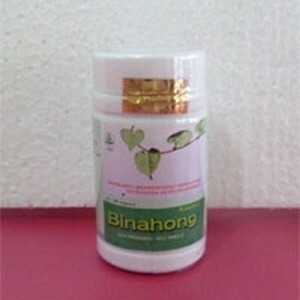 In addition to the above benefits, binahong also have efficacy as a drug to boost the immune system for cancer patients. Binahong now already widely known by the people of Indonesia as an herb that has benefits and efficacy as a medicinal plant families. Manufacturers of herbal medicines are now also many utilize binahong processed and packaged in the form of either drug in powder, capsule or tablet. However, most binahong processed and packed in capsules ready to drink. Help Fight Arthritis and Gout, Prevent Stroke, Restoring And Improving The weak condition Endurance Body For Cancer Patients . Content 1 Bottle Binahong 60 caps.